Smartphone Android Motorola Moto X. Fitur 3G, 4,7 AMOLED capacitive touchscreen, kamera 10 MP, Wi-Fi, GPS, Bluetooth. . Diumumkan Agustus 2013. Smartphone Android Motorola Moto G. Fitur 3G, 4.5 inch IPS LCD capacitive touchscreen, kamera 5 MP, Wi-Fi, GPS, Bluetooth. Diumumkan pada November, 2013. Motorola d520 phone. Diperkenalkan pada 1998. Hadir dengan fitur: Monochrome graphic display. Motorola M3888 phone. Diperkenalkan pada 1999. Hadir dengan fitur: Monochrome graphic display. Motorola M3788 phone. Diperkenalkan pada 1999. Hadir dengan fitur: Monochrome graphic display. Motorola M3688 phone. Diperkenalkan pada 1999. Hadir dengan fitur: Monochrome graphic display. Motorola M3588 phone. Diperkenalkan pada 1999. Hadir dengan fitur: Monochrome graphic display. Motorola M3288 phone. Diperkenalkan pada 1999. Hadir dengan fitur: Monochrome graphic display. Motorola M3188 phone. Diperkenalkan pada 1999. Hadir dengan fitur: Monochrome graphic display. Motorola cd920 phone. Diperkenalkan pada 1998. Hadir dengan fitur: Monochrome graphic display. 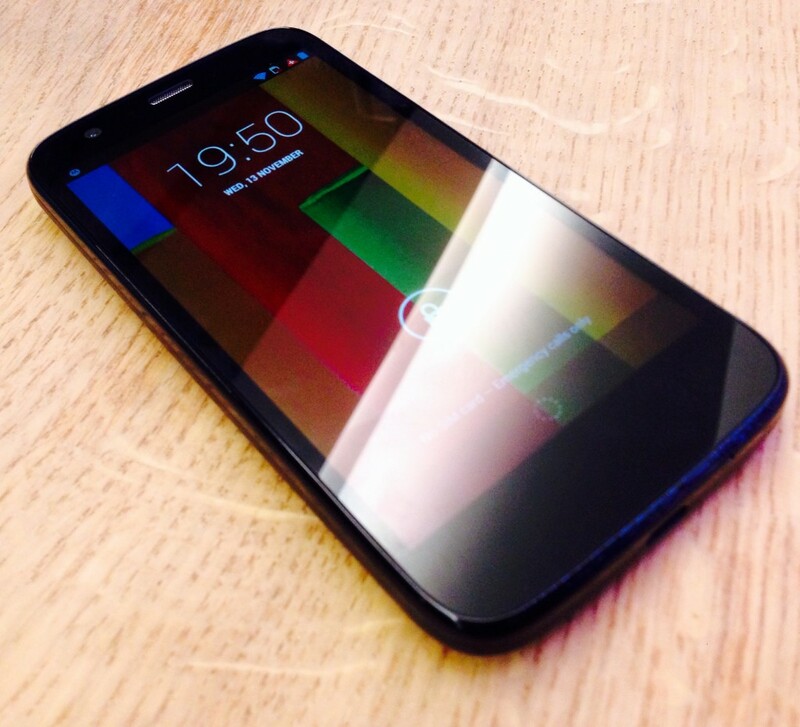 Motorola Photon Q 4G LTE Android smartphone. Diperkenalkan pada 2012, July. Hadir dengan fitur: 3G, 4.3? TFT capacitive touchscreen, 8 MP camera, Wi-Fi, GPS, Bluetooth. Motorola Electrify 2 XT881 Android smartphone. Diperkenalkan pada 2012, July. Hadir dengan fitur: 3G, 4.3? TFT capacitive touchscreen, 8 MP camera, Wi-Fi, GPS, Bluetooth. Motorola DEFY XT XT556 Android smartphone. Diperkenalkan pada 2012, July. Hadir dengan fitur: 3G, layar 3.7inch TFT capacitive touchscreen, 5 MP camera, Wi-Fi, GPS, Bluetooth. Motorola RAZR M XT905 Android smartphone. Diperkenalkan pada 2012, September. Hadir dengan fitur: 3G, 4.3? Super AMOLED Advanced capacitive touchscreen, 8 MP camera, Wi-Fi, GPS, Bluetooth. Motorola DROID RAZR M Android smartphone. Diperkenalkan pada 2012, September. Hadir dengan fitur: 3G, 4.3? Super AMOLED capacitive touchscreen, 8 MP camera, Wi-Fi, GPS, Bluetooth. Motorola RAZR HD XT925 Android smartphone. Diperkenalkan pada 2012, September. Hadir dengan fitur: 3G, 4.7? Super AMOLED capacitive touchscreen, 8 MP camera, Wi-Fi, GPS, Bluetooth. Motorola DROID RAZR HD Android smartphone. Diperkenalkan pada 2012, September. Hadir dengan fitur: 3G, 4.7? Super AMOLED capacitive touchscreen, 8 MP camera, Wi-Fi, GPS, Bluetooth. Motorola DROID RAZR MAXX HD Android smartphone. Diperkenalkan pada 2012, September. Hadir dengan fitur: 3G, 4.7? Super AMOLED capacitive touchscreen, 8 MP camera, Wi-Fi, GPS, Bluetooth. Motorola RAZR i XT890 Android smartphone. Diperkenalkan pada 2012, September. Hadir dengan fitur: 3G, 4.3? Super AMOLED Advanced capacitive touchscreen, 8 MP camera, Wi-Fi, GPS, Bluetooth. Motorola Electrify M XT905 Android smartphone. Diperkenalkan pada 2012, November. Hadir dengan fitur: 3G, 4.3? Super AMOLED Advanced capacitive touchscreen, 8 MP camera, Wi-Fi, GPS, Bluetooth.